Multi-platinum, Grammy Award-winning rock band LINKIN PARK will headline the third annual Bud Light River City Rockfest on Sunday, May 24 at the AT&T Center. This year’s Memorial Day weekend outdoor rock festival will feature more than 20 bands on four stages. Developed by Spurs Sports & Entertainment in partnership with AEG Live, the Bud Light River City Rockfest is an annual celebration of rock music, the largest festival of its kind in South Texas and part of the 2015 “World’s Loudest Month” festival series. More than 23,000 screaming fans attended last year’s event. 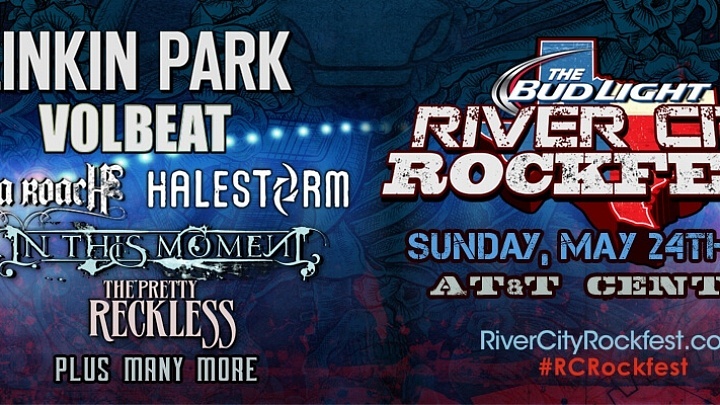 The third annual Bud Light River City Rockfest lineup also includes Volbeat, Papa Roach, Halestorm, In This Moment, Live, The Pretty Reckless, Anthrax, Scott Weiland & The Wildabouts, In Flames, We Are Harlot, You Me At Six, Upon A Burning Body and Crobot. Additional performers will be announced at a later date. A limited number of General Admission and VIP tickets to the Bud Light River City Rockfest will be available for pre-sale starting at 10 a.m. on Tuesday, Feb. 3 at a special price of $39.50 (plus fees) for GA and $199.50 (plus fees) for VIP. 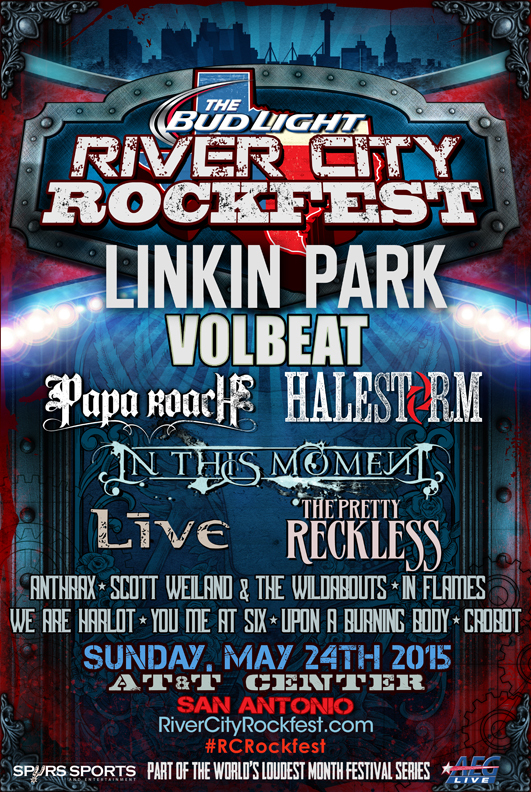 For more information and to get access to the Internet pre-sale, visit RiverCityRockfest.com and sign up for the e-newsletter. Discount pricing for Military is also available via The pre-sale ends on Thursday, Feb. 5 at 11:59 p.m., while supplies last. General Admission and VIP packages will go on sale to the general public on Friday, Feb. 6 at 10 a.m. and can be purchased at RiverCityRockfest.com, Ticketmaster.com and the AT&T Center Southeast Box Office. General Admission tickets can be purchased for $49.50 (plus fees) and VIP packages will be offered at $199.50 (plus fees). A GA four-pack can also be purchased for $180 (plus fees).